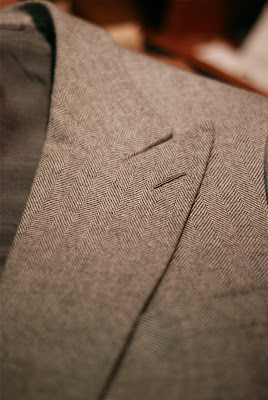 Cifonelli of Paris makes some of the most beautiful tailoring I’ve ever seen. 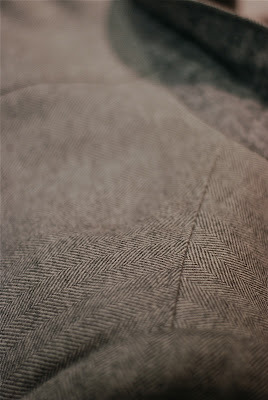 I thought a post, therefore, on the details of a jacket rather than me rambling on about the technical stuff. 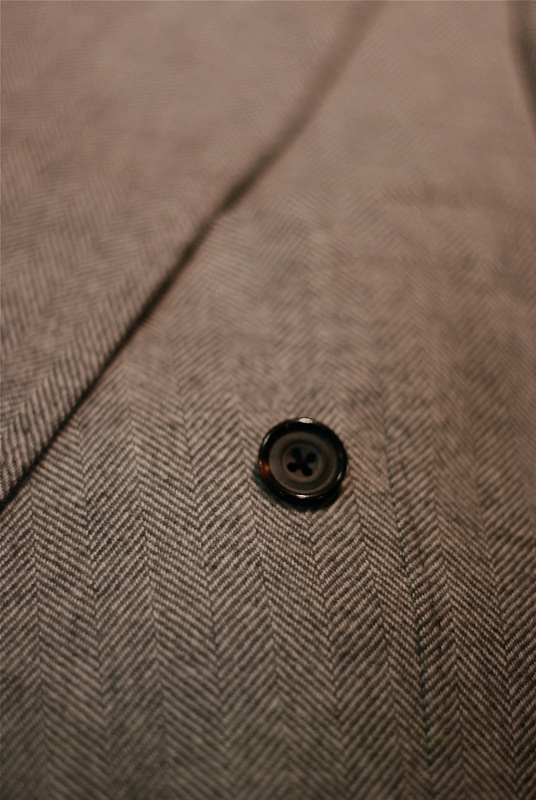 Above, the broad lapel of the double-breasted, with gorgeous double-sewn lapel buttonhole. Its raised nature make it an impractical thing, but nonetheless beautiful for it. Why do English patch pockets frequently have so little curve and character? You can follow the discussion on Cifonelli jacket in detail by entering your email address in the box below. You will then receive an email every time a new comment is added. These will also contain a link to a page where you can stop the alerts, and remove all of your related data from the site. Simon may i ask the price of this jacket? What cloth is that? 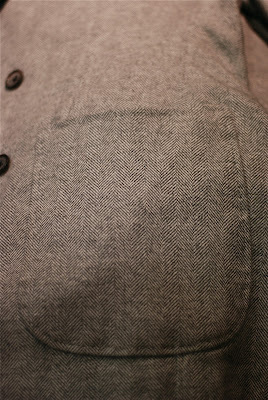 The inner breast pocket is so beautifully executed. That style (maybe it’s called Barcelona) makes relining a jacket trickier but it’s so much better than making the pocket mouth from lining. The sheer neatness of all the work is startling. I admit that I’d never even seen a piece of Cifonelli work until you featured it here. They really mark the pinnacle of good tailoring. That is magnificent. I’m not normally a fan of patch pockets, but these are a bit special. Since I do not live very far away from from rue Marbeuf, I will take just a closely look on what they have been doing. 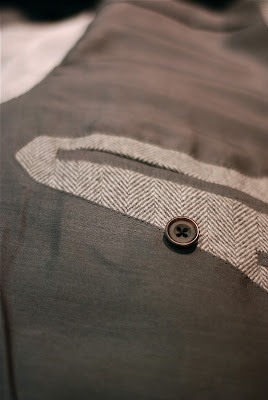 Hi Simon, thanks for sharing the beautiful Cifonelli details; what’s the fabric? Hi – the fabric is Harrison’s Moonbeam, 75% superfine lambswool, 25% angora. I believe that Cifonelli was very,very more expansive; much more that Huntsman,Rubinacci or Caraceni of Milan. That’s for a jacket, remember, not a suit. At current exchange rates to the pound, that’s more expensive. wow. how much for a suit? Thank you Simon for your answers. Prices are high indeed… This being said, we all agree here that the jacket seems to be really fantastic. Question for you: i saw that there is another Parisian tailor, called “Camps de Luca”. Do you know them? Heard of them? Are they comparable to Cifonelli in quality and in prices? You have highlighted a slight issue I have with your blog. That issue is the disconnect between quality and price, specifically – value. You feature many very well made and beautiful garments and shoes on your site, but sometimes I get the impression that you purchase certain items just because they are high end and therefore expensive/exclusive. The Cifonelli Jacket featured above is incedibly well made and a truely beautiful thing that you will treasure for many years, but in comparison to say an Andeson & Sheppard or something by John Kent, is it really worth the money? The Cifonelli jacket is a close call. But, there are other features, such as a the probably highly impractical eye shade with ribbon fastener. This is surely a choice of fashion/exclusivity over quality/value/practical benefit. Other example include Berluti shoes or anything by Kiton. All high end and the products of fine craftsmanship, but neither are really worth the over-the-top asking price if we are honest. Besides this slight qualm, please keep up the excellent work! It’s a good point. I wouldn’t say that Cifonelli is worse value for money than A&S though. It may even be better value given the work. It’s hard to argue over price with Berluti shoes, and with much of Kiton. But I would say with Kiton that they put a huge amount of work and investment in their things, rather like Hermes. It’s just a question of whether they spend on the right things. Loro Piana is similar. Thanks for sharing this information with us. Could you amend this entry with an image of you wearing the garment? You’re blog is awesome. Things can be beautiful for the sake of being beautiful. Price need not be a constraint all the time. You are free to look elsewhere for value. For naturally warming fabrics such as Moonbeam and cashmere, does lining make it wear warmer? Lining will make everything wear warmer, but only a little.